BE Festival, the Birmingham festival for daring and innovative theatre, comedy, circus and other performing arts, is touring three acts to showcase the best of what it has recently offered. Now reaching the hallowed hall of Circomedia, it presents a trio of shows that press against the boundaries of traditional circus. 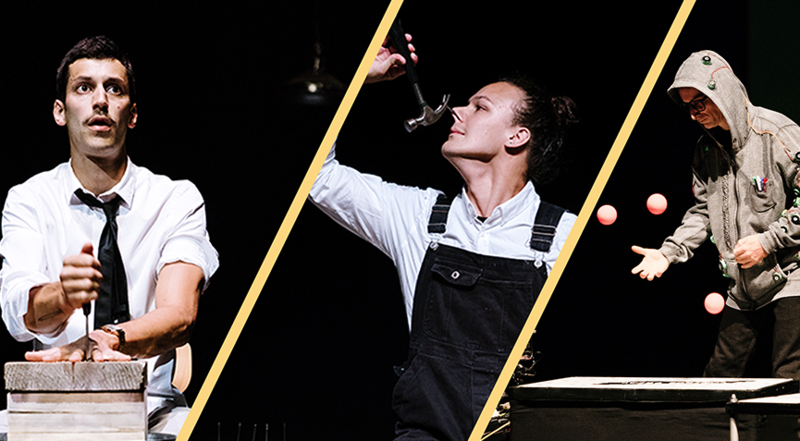 Swiss performer Oosterhoff delivers a playful, nihilistic show full of inventive and intriguingly low-level daredevilry. He starts by downing a series of whiskey shots, executing backflips after every glug, his grunts of exertion getting bigger each time. The masochism continues with precariously balanced knives and a fantastically creative set of acrobatics around a plethora of loaded mousetraps. Throughout it all, Oosterhoff maintains a great look of resignation, as if his performance, and his dance towards possible decline, is as inevitable and tiresome as a dull day at the office. With ‘Someone Loves You…’, UK performance artist, illusionist and professional liar Tom Cassani presents a manifesto on our collective construction of truth, the passing of time and the reality of things. In deadpan monotone, he instructs the audience to “keep your eyes open for the next 1 minute 37 seconds.” For the first half of the performance, he needn’t doubt the concentration of the crowd. Traditional tricks such as hammering a nail into his head and teleporting from one side of the room to the other are done with wit and sinister undertones. However, as the show goes on, the illusions disappear and Cassani delivers more overwrought monologues on family, truth and criminality. The best show of the three is left until the end, with Israel-based Kulu Orr’s pulsating, awe-inspiring ‘Control Freak’. Dressed in a suit layered with switches, Orr remotely controls the lighting and projections by slapping his body. He layers this with a musical accompaniment produced by juggling balls onto a drum machine, recreating what sounds like the Chemical Brothers doing covers of Muddy Waters, The Beatles or Nina Simone. It’s a show of incredible dedication and pinpoint accuracy, that also effectively uses audience participation without becoming hammy. Put simply, it’s a show that has to be seen to be believed.